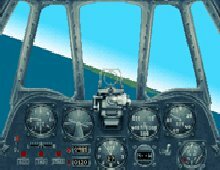 Certainly one of the best World War II combat flight sims of its time and arguably one of the best ever, Aces of The Pacific features a huge number of planes, decent controls, a nice 3D graphics-engine and good enemy AI. As the game title implies, this one covers the US-Japan conflict. From MigMan's review: "[the game] had detailed cockpits, different for each aircraft type and some of the most detailed ground objects seen at that time in a VGA sim. The sim had a fully featured flight recorder, so you could record and playback missions, and jump in and out of the cockpit during replay. Many levels of damage were modelled. Carrier Ops and Torpedo attacks were available. The aircraft had moving control surfaces and you could fly for both sides, USA and Japan, and in the Army, Navy or Air Forces." With the excellent Red Baron and then this WWII game, Dynamix and its star designer Damon Slye climbed up really fast to the heights of being flight simulation gods... ;) or sort of. Ok, these games look very dated nowadays, but back then around here there was all the craze going on about their games. :) It's a real conventional memory monster and thus a bit hard to get to run. Also check out the good successor Aces over Europe, which covers the European theatre of war. Last but not least, you can also download the rare WWII: 1946 add-on from the "Extras" section below. This disk adds the following aircraft: US: F7F, F8F, P-80, F2G-2 Japanese: J7W Shinden, Kikka, Ki-83. It also adds all-new "What-if" careers that recreate what may have happened if the US hadn't dropped the nuclear bombs on Japan and instead invaded the island.